Lord Cheverley, son of the Duke of Ithwick, never wanted to go to war, but when he eloped against his father’s wishes, the furious Duke forced him to choose—either take a naval commission, or have his marriage annulled. 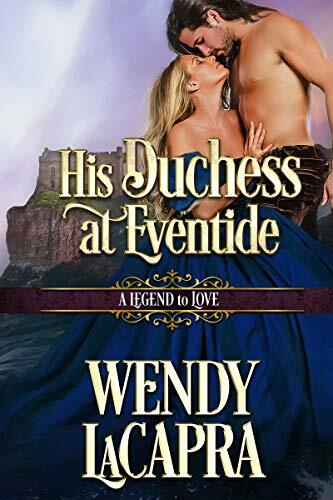 Devastated physically and emotionally by seven years of war, a shipwreck, and six years in the captivity of a brutal pirate, Cheverley returns to England to find that the courts have declared him dead, and his wife is entertaining suitors. Should he demand his rightful place, disrupting his family’s lives, or should he return to sea, seeking vengeance against the pirate? He sets out to find the answer in disguise. Penelope once believed in love, but then the man who swept her off her feet deserted her, leaving her and her unborn child utterly alone. Now a widow, she will do anything to protect her son, including enlisting the aid of a mysterious sea captain to uncover the true intentions of her devious suitors. When the captain awakens something in Penelope she thought long dead, she begins to suspect he is no stranger. But, as they peel back the layers of a deadly plot, can this broken family heal their wounds in time to save what really matters? Wendy LaCapra is an author whose stories engage my emotions and leave me eager for more. After enjoying her debut trilogy in 2015, I was sad when she stepped away from writing for a few years but that all changed in 2017 with the publication of her (2018 RITA® nominated) novella, Her Duke at Daybreak. She's back and better than ever. 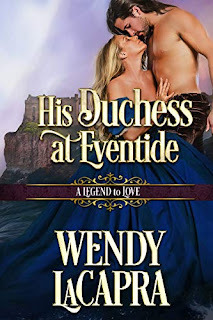 His Duchess at Eventide, a full-length historical romance that's sweeping in scope and stunning in emotional intensity is, for me, her best writing yet. Penelope and Cheverley drew me into their story as well as their hearts. I traveled this journey with them, experiencing their anger, fear, joy, anguish, yearning, and hope with a full investment in their happiness. LaCapra's beautiful writing brought it all to life, keeping me reading late into the night and finally leaving me with the reassurance that some bonds, though stretched beyond imagination, cannot be broken, that evil foes can be vanquished, that love wins. I won't be forgetting these characters - or their story - for some time. I highly recommend this book. Do you enjoy reunion romances? Do you like books that are deeply emotional or light and fluffy? Have you read any Wendy LaCapra stories? What's the last book that kept you reading past your bedtime? Winners will be randomly chosen from comments posted by 11:00 PM (EST), December 6, 2018. Reunion romances are a hit or miss for me. I'm a fan when the couple quickly overcome their past hurts or when the reunion is happy. Other than that, they tend to drag for me. I like both emotional and light books, it all depends on the mood I'm in. I've read Duchess Decadence by Wendy LaCapra. I don't seek out reunion romances but that is not to say that I have anything against them. I enjoy both emotion-filled stories and lighter ones depending on what I am needing when I am choosing my next read. I am always excited to find new-to-me authors and am intrigued enough by your review to add this author onto my list to try. The last book that kept me up into the early morning hours was The Keeper of Lost Things by Ruth Hogan. It was the elegance of the writing and the poignant scenes, as well as, the humor that kept me so enthralled. Janna MacGregor's The Good, The Bad and The Duke. I like romances that a deeply emotional. I do like reunion romances. I haven't read any Wendy's books. I enjoy reunion stories, if they are well done. If my mood is right, I can deal with both a light and frothy read or an intense and deep read. But, I am aware my mood has an influence on how I receive a book. The last book which kept me up was the Lady Travelers Guide to Deception with an Unlikely Earl by Victoria Alexander. Ms LaCapra is a new to me author and you have made me want to find this book. Thanks. Intriguing plot! I haven't read any of Wendy's books before, but I am now adding this one to my wish list. I enjoy reunion stories and second chances. I also enjoy both emotional and light/fluffy stories. It really depends on the mood I am in. The last book that kept me up for hours was The Demon Duke by Margaret Locke. I do love reading books that keep me up late. Duke with the Dragon Tattoo and The Good, The Bad, and The Ugly are two. This sounds lovely, but it's a shame that it's not in print. I've read tons of books that keep me awake way past my bedtime. I do enjoy reunion romances. In most, the initial getting to know each other is not necessary.. Getting to know each other again is different. They are starting with preconceived ideas of who the other is. They have to learn how the person has changed during the intervening years and how that changes their relationship. In this story, she is learning about a person not realizing he is already someone she knew. The recognition is there but deeply buried. Most of the time I prefer deep emotion in the stories I read. There are times when light and fluffy is needed and it is nice to have them available. I do not believe I have read any of Wendy LaCapra's books. The last book that kept me up late reading was To Catch a Texas Star by Linda Broday.